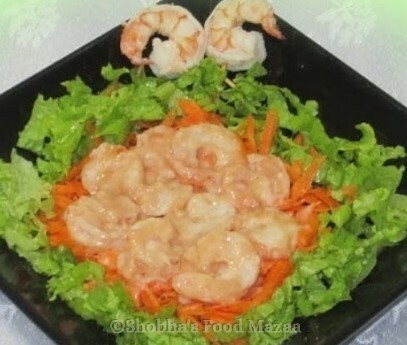 This is my favourite salad as I love shrimps.. You can enjoy this cool salad in summer. This can also be served in cocktail glasses...looks very decorative with the lettuce at the bottom, then a layer of carrot and shrimps on top. Decorate the rim with a shrimp. 1. Clean and de-vein the prawns. Boil them adding little salt for 1 minute. Do not over cook. Drain them and set aside to cool. Slice them into two (vertically), saving 2 for garnishing. 2. 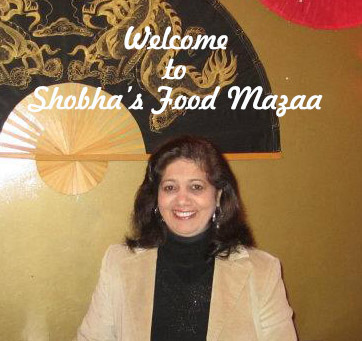 Mix the sauces together and add the prawns. Add salt if needed. 3. Cut the lettuce and sprinkle a little salt and a dash of olive oil and mix. 4. In a serving plate or bowl, spread the lettuce first, then grated carrot and spoon the shrimp salad on them. Shrimp salad looks lovely.. simple and comforting..
new to me.. interesting one..
Love your style of decoration. Very delicious and healthy salad. Just curious how can we et raw shrimps that aren't cooked ? Fresh & well presented salad!!!! wow! !look so delicious & restaurant style presentation! !